We actually managed two vide greniers in amongst all the naff weather. In the first, on Saturday, I got two DVDs ("Blown Away" and "Broken Arrow"). I've seen both before, but for €1 a pop (and original DVDs, not clones), it wasn't bad. There was a good line in horror (traditional American cheerleader/slasher stuff, no Asian) but as is all too often it is either a dub job or has forced French subtitles. During the Saturday one, mom noticed a strange plane flying over. It was white, had the length of a one-man vehicle (like a glider or somesuch). The wings were swept back like a fighter jet (not as severe as the Concorde delta, but not like a Cessna's. The tail was a dual-tail arrangement in the shape of a V. It was bright white, and the strangest thing, it didn't make a single sound. I would imagine, if there was a drone capable of carrying a person, it would be this thing. But no, it looked too big to be a drone. I wonder if it is some sort of experimental plane? Flight height was fairly low, about the height of short-hop propeller planes. On Sunday I picked up a little USB hub for €2. I bought it because it contains a card reader and I was hoping that it would read SDHC (my older reader freezes/crashes with anything over 2Gb). It works fine. And, I had a peek inside, it is actually a four port hub with the card reader hardwired to the fourth port. There are two white LEDs to light up a logo on the front. What is this, designer hardware?! Additionally, I got a little digital photo frame jobbie. Claiming to be by Auris Magnetic (seeing nothing on their site now, it looks like a selection of objects for people who think their body can be balanced by wearing magnets in specific places). Anyway, it is a 3.5" display but only 320×240 resolution. The colour reproduction is quite nice, although for flicker sensitive people (such as myself), the screen flickers almost as if interlaced at a lowish refresh rate. On the firmware side, the device, made in China with the part number EFN-ED38 is like typical Chinese firmware. It has potential, but it has only utilised this potential in the most basic way. For example, there is an RTC with clock and calendar, but there is only an option to have the clock visible on its own, no option to have the clock on-screen during photo slideshow. Likewise, there is an option to zoom into a photo (2×, 3×, 4×) but not only does it appear to zoom up the version in memory (thus meaning you don't gain any quality while zooming), but due to the lack of buttons, you can only move left and right, not up and down. There are a range of fancy swipes between images in slideshow (seemingly randomly chosen) but no option to switch them off and simply replace one picture by another. On the plus side, since the internal battery only runs for maybe two and a half hours, you can set a sleep timer (off/10-20-30 minutes). You can choose the time photos are shown in slideshow (3/5/10sec). It will speak to you in English, French, Spanish, German, or Italian. Plus, when you power up with an SD inserted, it will (slowly) enumerate the images on the card and then enter into slideshow mode automatically. It seems equally capable of JPEGs from TV grabs up to 7mpix photos. There is apparently M-JPEG support, though I've not tested it. Plugging in a USB lead, you can charge or access the connected SD card. It's a shame it won't permit both at the same time. On the hardware side, screen flicker aside (and it doesn't appear to be noticable by less susceptible people), the display has a wide viewing angle to the left, right, and above. The 'brightness' does not alter much depending on height (unless you look from below where you can get as far as a negative image). 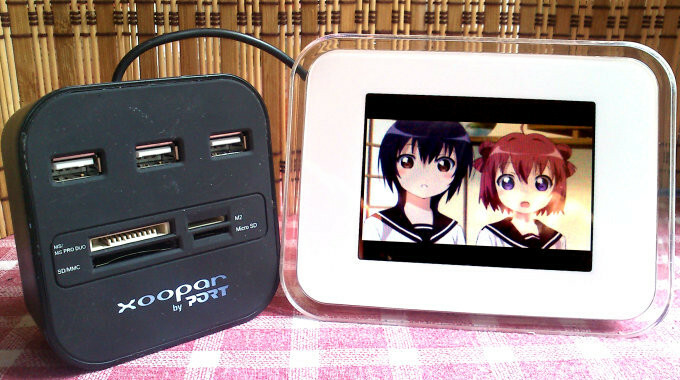 Therefore, this is a good display for a small photo frame. It looks like there are a lot of colours supported (I'm not sure if it is 65K, 120K, or a full 16M), there is no obvious banding from colour changes, even on flattish colour areas (I loaded up my SD card with screengrabs from animé). 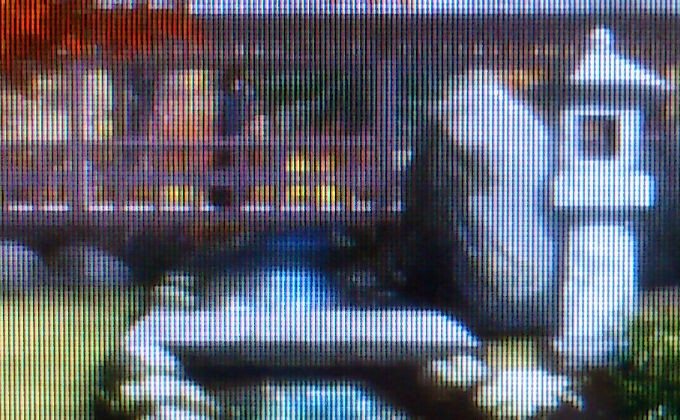 Although the resolution is low (320×240 in a 3.5" display), the pixels are close enough together that you can only really see this if you look closely. There is no brightness or constrast setting, however it looks fairly bright and sharp. It holds up its own in non-direct daylight. The main problem here is actually not the display itself, but rather the shininess of the plastic case. There is a built in 4Mb Flash, to which you can copy and/or delete photos. I guess it'll hold a reasonable number of photos if you process them down to 320×240 (ought to hold around 50-60 photos if you use good quality settings). You cannot directly access the Flash externally, nor can you copy from the Flash, nor does it appear that the device will auto-display from photos on the Flash. I guess it is a tick list feature more than anything else. Maybe, actually, the Flash is larger than advertised, the firmware being held on an inaccessible part? 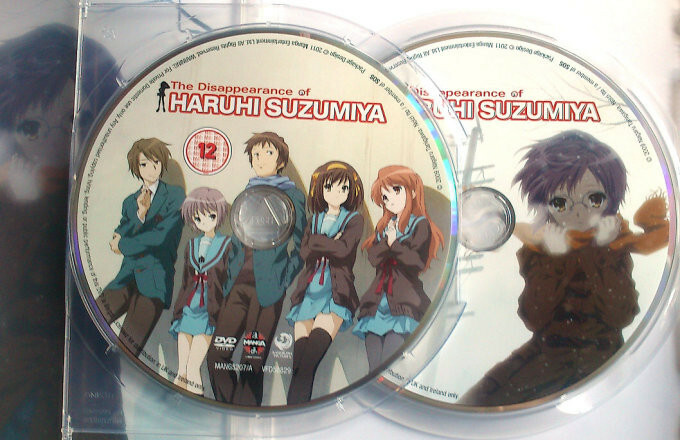 Last year I downloaded and watched "The Disappearance of Haruhi Suzumiya", an awesome film running to a little shy of three hours. As I like the Haruhi-verse, it was time to get myself the film. Sadly, as is often the case, while a local supermarket has a very impressive selection of animé (including such things as the Haruhi boxed set, Ergo Proxy boxed set, Serial Experiments Lain boxed set, everything Ghibli has ever done, etc), the company that makes these (Kaze) is only interested in a French translation. Sometimes you might find Dutch. You won't find any English. As such, this lovely collection is of no use to me. I went on Amazon (.fr and .co.uk) and some of this stuff is just not really available any more, unless you want to blow a large chunk of change to a marketplace seller. What a shame! Back to Haruhi. I found a new version of the DVD for a good price, actually cheaper than the French release. Promoted by Amazon as containing one DVD, I added two photos to the product description to help note the existance of the bonus DVD (pop over to the product page to view them). Plus a review which will appear in a day or two. I'm also really looking forward to watching the content of the bonus DVD. With the banks unable to run Ponzi schemes based on credit for land purchase, they will be hard pushed to find another way of making abnormal profits. They would be forced to fall back on the proper functions of banking - the provision of safe places to hold deposits, money payments and transfers, and the provision of legitimate credit. I do not see there being anything inherently wrong with LVT, in a way it is just an alternative method of raising/collecting taxes. However, I am concerned that if it is adopted it would be adopted as an additional tax, not a switch-over to it alone. Plus, it would be adopted if/when it could be shown to increase government revenue. Look at the current selection of characters in government, look at the Murdoch affair. Look at the declared anti-Murdoch guy being pulled from the case and the job given to a declared pro-Murduch person. Look at the Bank of England having to essentially bribe banks by saying they will inject cash provided the benefits things trickle down to small business guy who needs it the most. Look at all the crap and corruption and ask yourself if you think an introduction of LVT will be anything other than a way to screw you harder? This is not, I should point out, a fault of LVT. It is, however, a large fault of the messed up system that runs our economy. This is why I remain unconvinced of the attributes of LVT. It seems to be to be proposed to fix problems that just can't be fixed that way. As Mr. Law suggests, switching to LVT will make the banks suddenly behave and go back to the core job of providing finance? LVT will do that? Seriously? I'm thinking it might take a civil war to sort out that mess (as the government isn't really much better in this respect), but then that's just me. It is a worry I have with integrated fiscal policy of a rescued Europe - while it makes sense to have a greater cohesion between countries (which really should have been a part of the Euro plan from the beginning, not an "oh crap we didn't see this coming" afterthought), it should be done with the markets and the likes of the IMF at arms length. The banking sector is very important in the world's economy, but it is not God. We need them, but they need us. Somewhere along the way this has been corrupted into a hideous monster, and it will take a hell of a lot more than LVT to sort out the mess. Unfortunately Rick, you haven't senn the cat (Google it). What if we still had slavery, here in the West - would you argue in the same manner against abilition? Of course not! I'm not sure Henry has presented the ethical case, but then he was responding to your objections. Maybe you'll investigate further someday? Land value taxation will not make everyone into saints. But by rewarding good behaviour such as keeping land in good order and not holding on to land that one does not need, it will make the world a slightly better place. LVT makes it possible to get rid of other taxes, and that means that good behaviour is not punished. That too will make the world a slightly better place. By making land more readily available to people who are willing to work, there will be less poverty and that too must make the world a slightly better place. And now we come to the banks. If all the rent of land were collect and used as public revenue, land titles would have no value as such, since they would be transformed into rights of occupation subject to an ongoing liability. The present troubles with the banks have been ultimately due to the fact that it can be profitable to speculate in land titles through giving credit for land purchase. The banks effectively become landowners for the duration of the loan. What is labelled "interest" is, consists in this instance, mostly of land rent. Under an LVT system it is being collected as public revenue so the banks cannot get their hands on it. It is the same as banks lending to a business who is renting its premises. The land value of the landlord's premises cannot be used as collateral. The banks have no option but to reform. The business opportunity that leads to credit-fuelled land price booms and busts no longer exists.